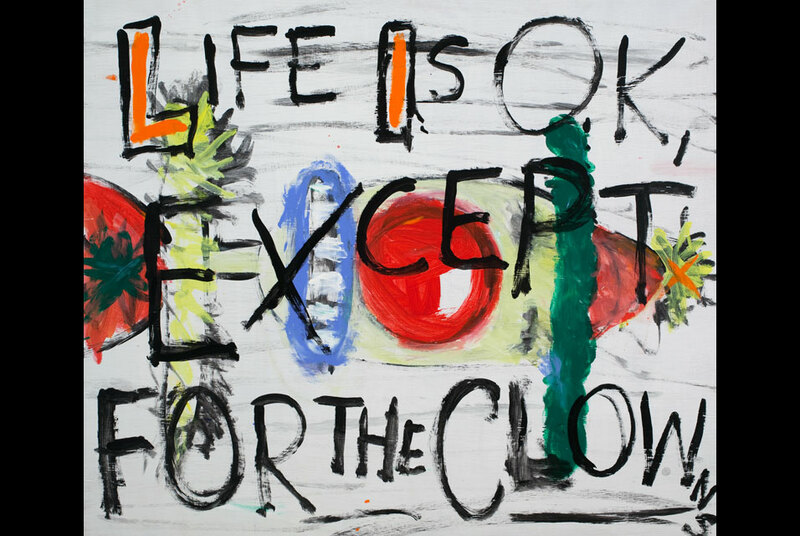 Jim Torok, "Life Is Okay Except for the Clowns," Acrylic on Panel, 36 x 42 inches. Photo: Courtesy Pierogi. BROOKLYN, NY.- Jim Torok is known for both his photo realistic, miniature portraits and his narrative storyboard, cartoon-like paintings, both based on acute observation. His portraits are generally of ordinary people he knowsartists, friends, neighborsand depict the everyday rather than celebrity status. They are small studies of fact and plainness. His cartoon works are simultaneously hilarious and sobering, innocently optimistic and cynical, because they state so plainly what is known but most often left unsaid. In this exhibition Torok will focus on the portrait, both realistic and cartoon-like abstractions. In Gallery 1 will be a group of Torok's miniature portraits-each no larger than 5 x 4 inches-primarily of his upstate New York neighbors. Gallery 2 will be filled with a new series of cartoon-like clown portraits and text paintings. As clowns often are, these are both comic and sinister. One text painting reads Life Is OK, Except for the Clowns. Another reads, You Are A Vibrant Human Being. Stylistically, the two groups of paintings could not be more different. The miniature portraits are carefully painted in oil with great detail using extra-fine brushes, whereas the clown portraits are larger and loosely painted in acrylic with brushy strokes of color on panel. The abstraction and loose rendering of the clown paintings links Torok's portrait work with his storyboard panel paintings. Torok's portraits are compelling studies that range from objective, life-like representations of real people, to entirely subjective, spontaneous abstractions. The work in this exhibition demonstrates a dexterity that few besides Torok can accomplish so seamlessly. In a sense he is painting independently with his left and right brain, each with complete control. At first glance these two bodies of work appear completely unrelated but they do have a real and fortunate co-existence. These are paintings that interpret the human condition and Torok makes no judgment about the distance between them, as he views the world through a wide lens. This will be Jim Torok's third one-person exhibition at Pierogi. Torok's work is currently on view in Portraiture Now: Communities, a three-person exhibition at The National Portrait Gallery, Washington, DC and was recently included in The Lens and the Mirror: Self-Portraits from the Collection, 1957-2007 (The Metropolitan Museum of Art, NYC), Attention to Detail, (The FLAG Art Foundation, NYC, Curated by Chuck Close), among others. He received a MFA from Brooklyn College and currently lives and works in Brooklyn, NY. Controversial Portraits of American Soldiers Now in Washington D.C.